Bob Dyson is a San Diego real estate legend who recently launched Sotheby’s real estate offices in the San Diego, Palm Springs and Las Vegas markets. He has kindly agreed to share some exciting news about a new real estate exchange program that is set to rock the San Diego real estate market mid-January. This program might do much to liberate locked-up equities in homes throughout Southern California. But I’ll not steal his thunder. With all the alarming issues facing us in the real estate market and all the turmoil in Real Estate lending, I have been searching endlessly for fresh solutions to these problems. What if we could create a new and faster way to buy and sell homes in todays challenging market? What if real estate buyers and sellers could focus on the deal instead of getting lost in the details of granite surfaces, designer amenities and upgrades? We believe our home exchange program will help stabilize our troubled real estate market and could be a program easily implemented in other cities outside of Southern California. There are more than 25,000 homes for sale within San Diego County. We believe there are also more than 19,000 qualified buyers who wish to purchase a home in San Diego RIGHT NOW. So where are the buyers and who are they? They are home owners living right here in San Diego. They are home owners with Frozen Equity – people who want to relocate right now but must sell their home first. Granted, there have real problems with the real estate lending industry . And the media has done an excellent job paralyzing the San Diego home buying public, scaring them away from purchasing. Recent statistics provided by First American Title Company show that in San Diego County, the Palm Desert/Palm Springs areas and Las Vegas, foreclosure activity is centered in small pockets of those communities. Areas like Rancho Santa Fe, Del Mar, Indian Wells and Summerlin have experienced very little impact from local foreclosures; however, those communities have been brought down by media hype and generalities. It seems that nobody at the media level, or especially the government level, is paying attention to details. Our congressmen who are holding hearings on these issue dont even know what questions to ask – much less are able to present viable solutions. From that calling session forward, our little group began selling homes at an incredible pace. In January of that year alone, we sold 48 properties. We took our San Diego real estate clients who had good equity, good jobs and good credit and matched their wants and desires to move up with other clients selling their homes who desired to move down. Two purchase agreements were drawn up, each contingient upon the concurrent close of the other. Both clients got new loans and became a buyer in one escrow and a seller in the other. The process and the response exceeded our wildest expectations. We provided all parties with work sheets, we moved sales prices and new loan amounts around with our lenders and, in most cases, satisfied the needs of both clients. Today, we are taking our exchange idea of the 90s, dusting it off and are updating it with todays technologies. What is evolving is an industry-supported effort to help buyers and sellers with good credit, good jobs and solid equity move NOW. And thats How I See It. 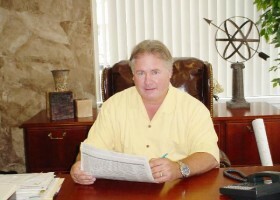 Bob Dyson is the Broker of Dyson & Dyson Sothebys International Realty in Palm Desert/Palm Springs, Calif. and Las Vegas, Nevada and Villa Sothebys International Realty in Del Mar, CA. With nearly 40 years experience in the Real Estate Industry, Bob has become an industry innovation leader. In addition to his many years in the brokerage industry, Bob is also involved in real estate mapping and development and currently has several thousand acres in various stages of mapping and development in Southern Nevada and Southern California. Dyson & Dyson Sothebys International Realty and Villa Sothebys International Realty were founded in Southern California in 1988 under the name Dyson & Dyson Real Estate Associates. Offering a variety of unparalleled real estate services, the brokerage operates offices in Las Vegas, the Palm Desert/Palm Springs area, and Garner Valley under the name Dyson & Dyson Sothebys International Realty and in the San Diego County area under the name Villa Sothebys International Realty. Each Sotheby’s real estate office is independently owned and operated. For additional information, call Mike or Roberta Murphy, CRS, at 877-818-8197.